Thousands of music lovers have lined the streets to “raise the roof” in tribute to Prodigy frontman Keith Flint. 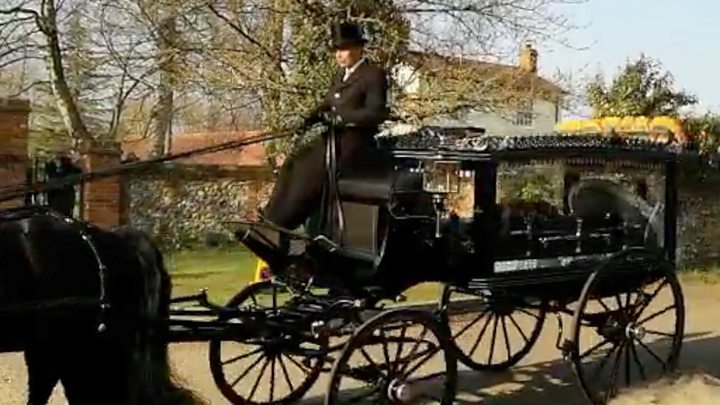 Fans watched as a horse-drawn carriage carried his coffin, topped with a green microphone, to his funeral at St Mary’s Church in Bocking, Essex. Bandmates Liam Howlett, Maxim and Leeroy Thornhill were met by cheers when they arrived at the service. Flint, 49, was found dead at his home near Dunmow on 4 March. The band had previously called on fans to “raise the roof for Keef” and line the route of the funeral procession through the singer’s hometown in Braintree, Essex. Speakers were set up outside the church to broadcast the service to the crowds. Rev Rod Reid led the service, which included poems, readings and music from System of a Down, Van Morrison and Pink Floyd. A eulogy was also read out by actor Paul Kaye. Flint’s wife Mayumi Kai was among those in attendance, along with All Saints singer Natalie Appleton, wife of Liam Howlett, and Cyrus, Flint’s beloved German shepherd dog. The 1.5-mile procession started at 15:00 GMT and local schools closed from midday to allow pupils and parents to escape the anticipated traffic chaos. Fans from around the world gathered to pay their respects. 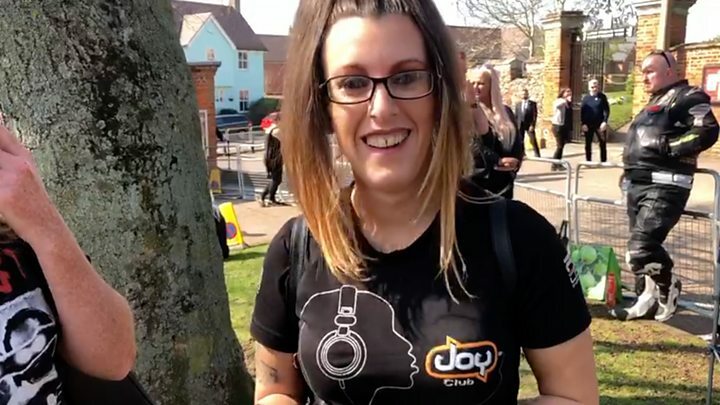 Superfan Araks Azarian, 36, jetted in from Australia to see the funeral procession while Marie Lelicova, 25, travelled from Prague to remember Flint, whom she said she had “loved since she was a child”. Following the funeral, fans continued to pay tribute to the singer and police were forced to close several roads around the church due to “a large amount of pedestrians in the area”. Flint was born in Redbridge in north-east London and his family moved to Braintree where, in 1990, he co-founded The Prodigy with Liam Howlett and Leeroy Thornhill. The Prodigy had been due to tour the United States in May and released their latest album No Tourists in November. Most recently they had been on tour in Australia. The mood swung from wild raving to moments of respectful silence and others of hilarity as stories of Keith Flint’s life were told. Drum and bass music blared as revellers awaited the arrival of the funeral procession, before the thrum of motorbike engines could be heard escorting the coffin to the church. As Flint’s bandmates Liam Howlett, Maxim and Leeroy Thornhill approached the church they were cheered by the crowds who shouted “we are with you”. During the service some sobbed, others sang along with the music.